Sr. Edith Prendergast, RSC, current Director of the Office of Religious Education is retiring this year. She took the helm as the first woman director of the office in 1987. Our 2015 Los Angeles Religious Education Congress is just one month away. Congress tickets will continue to be mailed this month - along with the first batch of Youth Day tickets. Also note that Monday, February 16 is the last day you can pre-order customized T-shirts for Youth Day. Watch a behind-the-scenes video from the Rally rehearsal from Youth Day Training Day at www.youtube.com/watch?v=3cAuqcMhg3M. Last month, teens from across the Los Angeles Archdiocese came together to prepare in a training day for Youth Day 2015! Need the Guidebook in Print? Following nearly three decades of service, Sr. Edith Prendergast, FSC, will be retiring as director of the archdiocesan Office of Religious Education, effective June 30, 2015. Sr. Edith describes her 27-year tenure as “a very energizing experience." "It’s all been very, very positive for me. What helped sustain me along the way is certainly my passion for this ministry, my vision, my excitement about it, and the relationships that I have created along the way, which are central to building community,” she said. She will be succeeded by Fr. Christopher Bazyouros, it was announced January 15. Los Angeles Archbishop Jose Gomez appointed Fr. Bazyouros as the new director beginning July 1. Fr. Bazyouros has served as associate pastor at several different churches in the archdiocese, most recently as Pastor of St. Albert the Great Church in Compton, Calif., before coming to the ORE to help in his current ministry as the Adult Faith Consultant. You must attend one of seven mandatory trainings to serve as a FLOOR Extraordinary Minister of Holy Communion. See the Volunteer page for more information, training locations, and the link to sign up. Though Fr. Richard Rohr won't be appearing at Congress this year, he is scheduled as a guest on Super Bowl Sunday on "The Oprah Winfrey Show," airing February 8, 2015. The show is expected to feature some of Rohr’s 14 books as well as discussion of his ministry in audio, video, retreats, conferences and personal appearances. Fr. Richard Rohr, a Franciscan priest of the New Mexico Province, founded the Center for Action and Contemplation in Albuquerque, N.M., where he currently lives. Fr. Rohr was with us last at Congress 2013. His new book with Franciscan Media, "Eager to Love: The Alternative Way of Francis of Assisi," reveals how revolutionary St. Francis was in his own time and how he is still changing lives today. Session X - "Snapchat Relationships"
Have intimacy issues? Do relationships last as long as a Snapchat picture? Do we understand what it means to be intimate? This workshop will look at healthy intimacy in all our relationships – with others and especially with Christ. Authors and performing artists appearing at Congress have scheduled times to sign their books and CDs at the Signing Area. The tables are located in the southeast corner of Hall A. Check the posted schedule for new speakers and updates to appearance times. Congress annually offers a variety of liturgies and prayer services. We will be featuring some of our 17 Eucharistic Liturgies and 4 Prayer Services from the Congress weekend here in our Emailings. The Australian Culture Mass is new to Congress in 2015. Come and celebrate the universal Church with Aboriginal dance, the haunting sounds of the didgeridoo, and Aussie musicians Michael Mangan, John Burland and Andrew Chinn. Fr Richard Leonard and Fr. Rob Galea will lead us in a liturgy steeped in both the ancient and modern Church from "the land Down Under." Singer/songwriter Fr. Rob Galea, a Catholic priest, is an assistant parish priest and also a Chaplain at Notre Dame College, both in Shepparton, Victoria, Australia. In addition to his series of recordings and CD releases, Fr. Galea has written a number of songs for various campaigns and international conferences. He was selected to sing the official 2008 World Youth Day song, “Receive the Power,” and performed in some key events before the 500,000 pilgrims in Sydney. He is co-founder of Stronger, a youth program that is quickly becoming one of Victoria state’s largest Catholic youth movements. Fr. 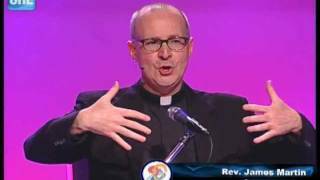 James Martin is a Jesuit priest and Editor at Large of America magazine. He is author of several award-winning books, including “Jesus: A Pilgrimage,” “Together on Retreat,” “Between Heaven and Mirth,” “The Jesuit Guide to (Almost) Everything” and “My Life with the Saints.” The popular speaker has given retreats and presented to parish groups and national conferences, and for the past several years has been a frequent speaker at the Religious Education Congress. The person at the center of our lives, Jesus, can sometimes seem so distant. But by entering more deeply into the Gospel narratives, we can come to know him more deeply. Fr. James Martin will help you look at both the historical Jesus (the man who walked the dusty earth of first-century Palestine) and encounter the “Christ of faith” (the one who performed miracles, rose from the dead and now lives with us through the Holy Spirit). Come and meet Jesus anew! Too often the Gospel message is reduced to a bland series of dos and don’ts. Join Fr. James Martin in looking at not only the places where Jesus shows us his own joy, but also how the saints and the great spiritual masters used joy, humor and laughter in their quest to holiness. All this and some great jokes, too! Watch Fr. James Martin's March 19, 2011 Arena workshop, Session #6-15, "Finding God in Your Daily Life." You can watch other past Arena workshops for free on our YouTube Channel at www.youtube.com/RECongress. And you can still find his other 2011 workshop, Session #8-12, "Jesus, Mary and Joseph." Did you know you can still find all the recorded sessions from Congress 2011 on our RECongress 2011 Recordings page?